Sometimes things just seem to come together. 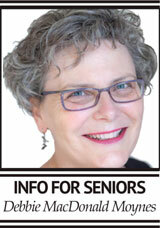 I recently wrote in this column about not being able to find free calendars to give to seniors this year. I said that last year I sourced a free falls prevention calendar. The year before free calendars were not to be found that year people in this community donated calendars and then seniors who needed them picked them up here. What a nice thing to do on all sides. So, this year when I wrote about not finding free calendars, again people in the community started dropping off ones that they had and weren’t going to use. In the meantime I’d been poking around the internet and sent off an e-mail to the Dairy Farmers of Ontario. I didn’t hear anything until a box of calendars arrived last week. Who knew the Insurance Bureau of Canada reads my column! So, the calendar angels have come through this year…in a big way! Thank you to all involved. But wait, there’s more to tell you…seniors like the OAS/CPP dates to be in the calendar and we always slip in papers with the list of dates for the coming year. This year the 2019 dates are not on the government website. If you come for a calendar now you won’t get the dates with it. Also, the BASSIC calendars haven’t yet arrived. Stay tuned. So now we know that there are “calendar angels” and it makes us wonder if there are “snow angels” out there. Other communities (Hamilton, Windsor, Kingston to name three) have a program where neighbours help neighbours with snow removal and sidewalk shovelling. Here at Community Care we provide home workers for seniors and some will do snow removal but covering such a large geography is a challenge. Are there snow angels in the county that could pitch in and help their neighbours? Why not keep your eyes open for such opportunities. Sometimes these informal responses are the best way to help each other. A note about the County Seniors Centre: all events and activities require advance registration. If we don’t know you’re coming we’re likely to cancel. Please call the office at 613-476-7493 the day before to sign up.